Masked men raided a woman's house as she was praying in her bedroom. 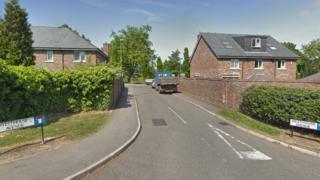 The four armed men threatened the woman as they ransacked her room in Westhouse Avenue, Durham, about about 19:00 GMT on Friday. One of the men threatened her adult son with a knife as he returned home before the gang escaped with cash and jewellery. Durham Police said it was a "terrifying ordeal" and a "targeted attack". They are appealing for information. A force spokesman said the men, who were all masked and wearing black, smashed the glass on a patio door to get in before going upstairs to confront the woman. The intruders threatened the "terrified" woman and demanded the jewellery she was wearing. They then ordered her to look away as they ransacked the room, taking more jewellery and a "substantial" amount of cash. Both victims were physically unharmed but have been left distressed, the spokesman said. Det Con Laura Douglas said: "This has clearly been a terrifying ordeal for the victim. "We feel sure that this was a targeted attack and there is no reason for the wider public to be alarmed."